creative producers. IP helps to manage risk, settle what is valuable, extract revenues, and protect future profits. It is the central mechanism in organising the market for creative goods. 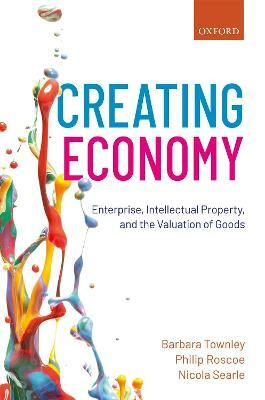 in creative industries, and will be of interest to scholars and policymakers alike. Barbara Townley is Emeritus Professor, School of Management, University of St Andrews. She received her doctorate from the London School of Economics, and previously taught at the universities of Lancaster, Warwick, Alberta Canada, and Edinburgh. Widely published in European and North American journals in management and organization studies, her work has been reprinted several times. At St Andrews she was Director of the Creative Industries Institute, leading an innovative Masters programme and, supported by ESRC, AHRC, and RCUK grants, researching various aspects of the creative industries. Philip Roscoe is Reader in Management at the School of Management, University of St Andrews. He is interested in markets and organizing. He holds a PhD in management from Lancaster University, an MPhil in medieval Arabic thought from the University of Oxford, and a BA in theology from the University of Leeds. He has published in leading sociology and management journals, and is committed to communicating ideas to a broader audience; in 2011 he was one ten winners of the inaugural AHRC BBC Radio 3 'New Generation Thinkers' scheme, and his book I Spend Therefore I Am was published by Viking in 2014. Nicola Searle is an economist specialising in Intellectual Property, with a focus on the Creative Industries. Her book Economic Approaches to Intellectual Property was published by Oxford University Press in 2016. She is a Senior Lecturer at the Institute for Creative and Cultural Entrepreneurship at Goldsmiths, University of London, where she holds an EPSRC Digital Economy Fellowship.